Matty V. says UMass is ready to add two transfers from Notre Dame and one from Michigan. We've already talked about Wolverine transfer Michael Cox. 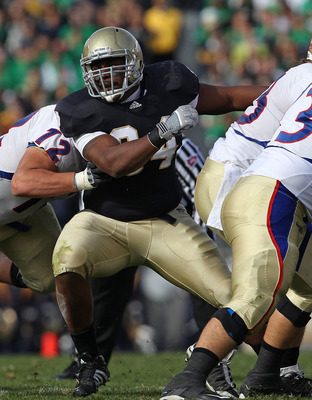 New to the transfer list is Hafis Williams a 6-1 295 pd SR nose tackle. Williams Notre Dame bio here. He played in 19 games for the Irish and had 13 career tackles. 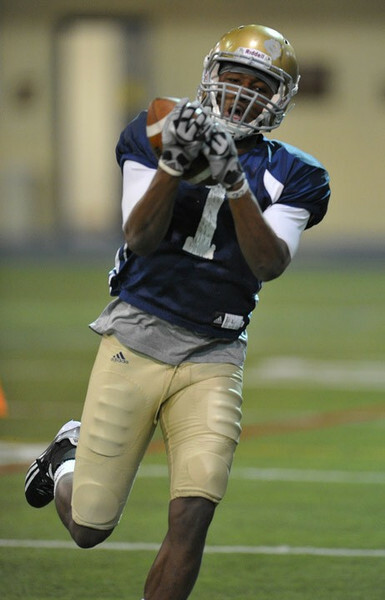 Listed as a "probable" transfer is Deion Walker, a 6-3 206 pd WR from Christchurch, VA. His Irish bio here. Appeared in 5 games for Notre Dame with one catch for 15 yards. South Bend Tribune has a story of Walker and Williams' transfer to UMass. Welcome to both. UMass has had some highly successful transfers in the past. UMass fans wish them a great senior season with the Minutemen. 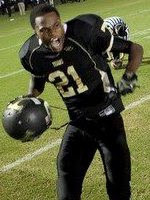 Rivals.com reports UMass has offered to Vontarius West, a 5-11 170 pd CB from from Bartow, FL. West's Rivals page is here. West holds offers from Ball State, Florida International, Houston, Iowa State, Memphis, South Florida, Western Kentucky and Western Michigan. The MAC Blog "Hustle Belt" has a post on the best four seasons in UMass football history. Victor Cruz's NFL jersey is # 18 in overall sales ranking. Giants 101 says the injury to Hakeem Nicks may cause the Giants to move Victor Cruz to the outside. Bleacher Report looks at the best 20 value players and finds Victor as #18. ESPN Boston says James Ihedigbo's shoulder injury is still holding up his re-signing with the Patriots (near end of article). Brandon London is apparently still with the Montreal Alouettes. Wasn't there a press release he had signed a NFL free agent contract? Nice story about Travis Tripucka trying to make the Rams by STLtoday.com. "I could have gone to Notre Dame, but I'm really glad I stuck with U- Mass because I did things at UMass that I never would have been able to do at Notre Dame," Tripucka said. "It was a great experience for me." CBS Sports has a blog entry on the 10 toughest schedules in FBS. It mentions UMass, but the Minutemen are not included in the list, although our OOC schedule should have given us honorable mention. 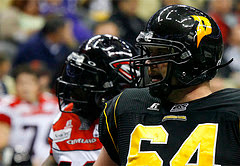 Former UMass OL Greg Niland is playing for the Pittsburgh Power. Niland's Power bio here. The MAC Blog "Hustle Belt" ranks the MAC teams by the number of Phil Steele preseason All-Conference players. We're ahead of Akron. Phil Steele has a blog post on % of offensive yards returning. With UMass losing most of its receiver corps and Jonathan Hernandez, the Minutemen rank #100 nationally. 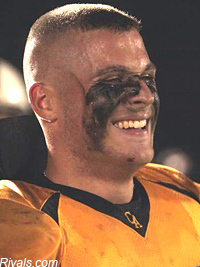 He was the district's defensive player-of-the-year. Besides UMass, Armstrong has offers from Buffalo and Temple. Drawing interest from a number of Eastern schools. The UMass football program will has its annual Golf Classic in June. The Football Golf Classic is June 22 at Wachusett Country Club in West Boylston. The event starts at 10:30 a.m. and will conclude with a dinner and awards ceremony, along with a preview of the 2012 season from head coach Charley Molnar. UMass Football Golf Classic application form here (.pdf download). The Union Leader discusses the state of the CAA from UNH's perspective. At the end of the article it says there have been no discussions with UMass about continuing the UMass-New Hampshire rivalry as an FBS-FCS game. The Patriots have done their annual player numbers update. James Ihedigbo did not have his number reassigned, so that's probably good news for him. Phil Steele has a chart on his blog listing the number of returning lettermen vs letterman lost. UMass comes in a #44 nationally with 42 lettermen returning, 17 lost, 71,19% 59 total. The Minutemen come in on the lower range of total letterman because of the lower number of scholarships in FCS. As Phil Steele notes there is also a wide variation in how schools award letters. Football Scoop has a story and a link to a USA report on athletic director's salaries. They missed John McCutcheon. Vanderbilt who is on our OOC schedule this year, had the highest paid AD ----- David Williams at $2.56 million. 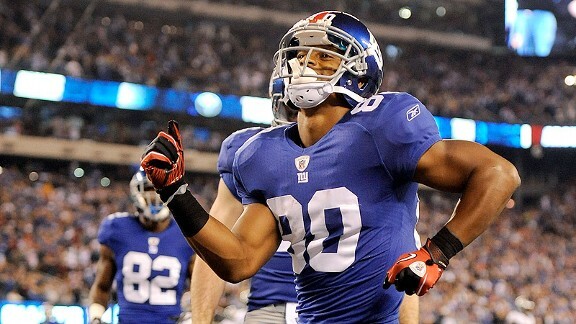 Rant Sports says with Hakeem Nicks injured, Victor Cruz is now the #1 receiver for the Giants. ESPN New York says Cruz is adjusting to his new status with the Giants-----as a veteran. The Seattle Times has a nice human interest story about former NFL and MAC QB Jon Kitna's new gig as a high school math teacher. Fos Sports has an article about conference realignments and "rivalries replaced" mentions UMass and the MAC. We've all felt that UMass' offensive line is one of the units that the Minutemen are most FBS-ready. Phil Steele has a post giving the national rankings of offensive lines by the number of career starts returning in 2012. The Minutemen are #20. Malcolm Speller SR 6-4 300 was the listed backup to Josh Samuda on the two-deep last year. The Delaware Blue Hens are wondering what they should do if any more changes hit the CAA. How will the Big East's media deal play out? The league thinks it could be as high as $130 million, but CBS Sports thinks the league could take in as low as $60 million. If the Big East is low-balled, SB Nation thinks that could trigger more realignments in the East. OT, but Fox Sports Midwest says adding Butler and VCU make the A10 a conference on the rise. Massachusetts cows crash party, bully guests and drank their beer. 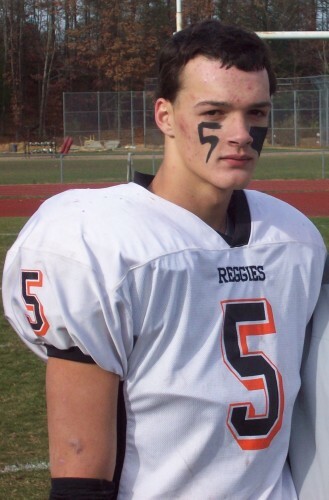 ESPN.com reports UMass is interested in Jacob Barchard, a 6-2 198 pd WR from Lawrence, MA. Also drawing interest from South Florida and West Virginia. I didn't get to go to the "Meet and Greet" with coach Molnar last evening because Mrs Blog and I didn't get back from Maine until late. The shot above is of York's iconic Nubble lighthouse taken with Mrs. Blog's little point-and-shoot. Click on the image for a larger view. Bleacher Report discusses Michigan's defensive line. Mentions UMass. Seacoast online says it's uneasy times for UNH sports with the changes in the CAA. Opposing views.com looks at the prospects for Akron in 2012. If UMass is going to win some (any) games this year, the Zips are probably the most likely prospect. A Bleacher Report (what would a football blogger do without them), has a slide show on the best football coach of all 127 FBS team. Their pick for the Minutemen----Don Brown. 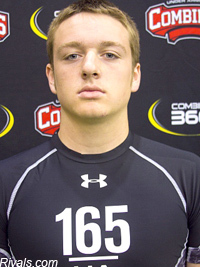 Rivals.com says UMass is interested in Ryan Casey, a 6-1 210 pd pro-style QB from Kenosha, WI. 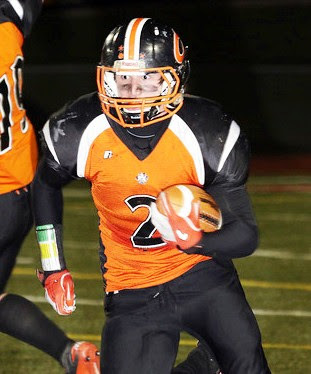 Casey has FBS interest from Syracuse, Temple and Tulsa. FCS interest from Brown, Princeton and Northern Iowa. Remember the "Meet and Greet" with with Coach Molnar is today at the Amherst Brewing Company. UMass football loses a recruit to-------UMass Lax. The Big Ten Network previews the league's week #3. Mentioned are Coach Molnar and former UMass assistant coach Ted Roof. 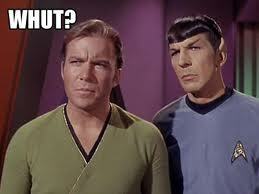 The Sun Belt conference stated they are not taking any more members for the immediate furture. That rules out Liberty and Idaho. The Sun belt's decision may knock Idaho and New Mexico State into FCS. Rival.com reports UMass has offered to T.J. Douglas, a 6-0 178 pd athlete from Ft. Myers, FL. This article mentions his offer from UMass. ESPN has a recruiting video here. 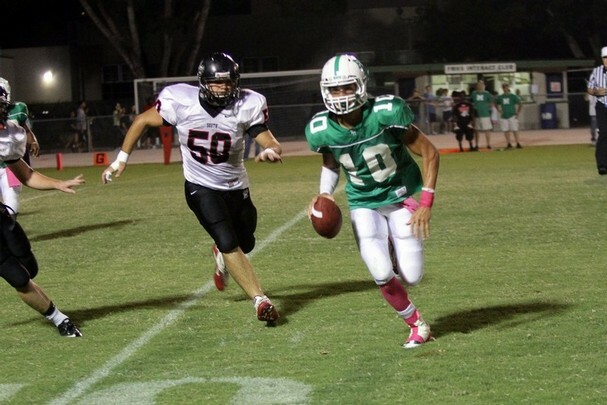 Douglas has offers from Arkansas State, Boston College, Florida International and Purdue. The Big Ten Network looks ahead to 2012's week #2. Indiana at UMass and New Hampshire @ Minnesota look interesting. The Gophers lost to NDSU last year and UNH has a history of upsetting FBS opponents. We'll know more of what kind of year UMass will have after the UConn game. It we're competitive against the Huskies, then we could give Indiana a hard time. The Boston Herald has a story that says college football should define the end game and then restructure. In another case of serendipity, Victor Cruz is playing a charity softball game in a "Fight ALS" group captained by LeSean McCoy. UMass has offered to Calvin Bowens, a 6-2 215 pound OLB from Treasure Coast HS in the Tampa Bay area. Bowens' Rivals page here . Bowens was first-team all-area and averaged over 12 tackles per game. CBS Sports.com says it's the conference realignments that are creating the room for FCS teams to make the jump to FBS. TC Palm.com says college recruiting is as much about relationships as it is about talent. 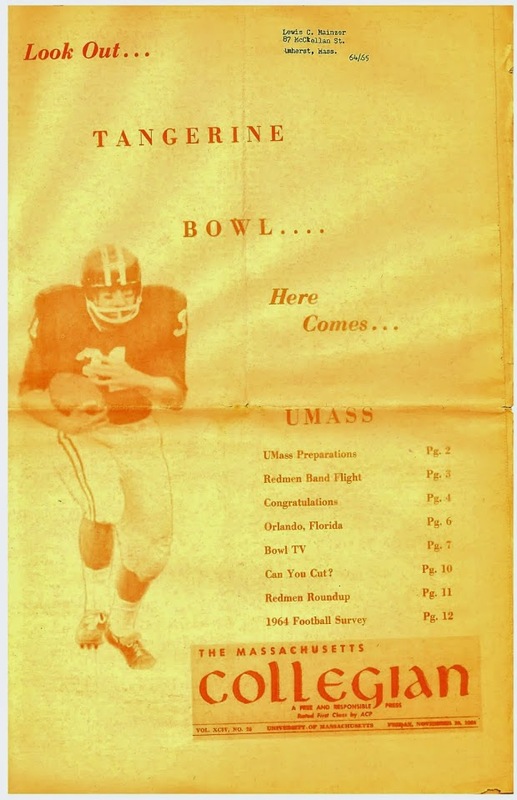 The article talks about UMass' Alan Suber. I've always talked here about UMass eventually getting consideration about joining the Big East if Coach Molnar can fashion a winning program in the MAC. However, what about the ACC? This article talks about Clemson and Florida State leaving the ACC, which would create some room. Of course, joining the Big East is only an option if it's still around. The CAA ponders its next move in football. Rivals.com reports UMass has offered to Arthur Williams, a 6-3 198 pd safety from Sebring, FL. Williams was the overall MVP of Sebring's spring camp. UMass is Williams only offer at this time. He's drawing interest from Boston College, Florida International, Miami of Florida, South Florida and Western Kentucky. Thirty-one (not counting UMass)MAC conference players signed UDFA contracts in 2012. The Boston Herald hires a UMass grad as their Patriots beat reporter. Nice job! Rivals.com states UMass has offered to Haiden Nagel, a 6-2 225 pd OLB from Tampa, FL. 2011 Holiday mini-camp award winner. Nagel also has an offer from UAB. Blog news: Mrs Blog and I will be up in Wells, ME for next four days. As usual I'll try to keep the blog going if I have a WI-FI connection. If the blog falls silent, I'll be back in operation later in the week. Phil Steel has his preseason All-MAC team up. Making the list from UMass are OT Nick Speller and Virginia Tech transfer Jerome Lewis on offense. On defense, the Minutemen's lone selection is LB Perry McIntyre. The UMass announcing team has won two AP broadcasting awards for the UMass-Temple basketball game and for the December 10th "Sports Insider" issue. A Toledo Blade writer notes that the MAC has been left out of conference realignments. It's a slow news day in the intertubes for UMass or MAC news. The CAA has definite Mid-Atlantic tilt to it and seems to leave Maine and UNH as the odd teams out. The Black Bears and the Wildcats are going to have to scramble to cover their travel costs. One thing they could do is add a second FBS game to increase revenue. A number of western and mid-west FCS teams play two FBS teams every year. The Washington Post says the CAA will be shopping for schools in both football and basketball. Michigan, one of our two Big Ten OOC opponents this year is up to #9 in ESPN's post-spring national power rankings. The ESPN Big East Blog rates our OOC opening opponent UConn #6 and MAC-transfer Temple #8 in its post spring power rankings. BTW, Boise State still plans to play in the Big East in 2013. Old Dominion's move to CUSA, is already changing the recruiting dynamics in the Tidewater area. Justin Goodwin, a 5-11 185 pd athlete from Madison, NJ has chosen Rutgers over offers from Old Dominion, Temple and UMass. Goodwin's 247 Sports bio here. New UMass football head coach Charley Molnar continues his state-wide tour with a stop at the Amherst Brewing Company on Thursday, May 24 from 5:30-7:30 PM. Fans can join Coach Molnar as he lays out his vision for UMass football both on and off the field as the Minutemen prepare for their first full season as members of the Football Bowl Subdivision and the Mid-American Conference. The CAA loses another member as Old Dominion announced yesterday that they are moving to CUSA. Ball State HC Pete Lembo says Ball State will move to a 1-2-1 scheduling philosophy. Hopefully, in 2015 or so, UMass will lighten the schedule to a similar system. Right now we need the money for the move to FBS, but going 0-4 every year in the OOC schedule will not build fan enthusiasm. Athlon Sports looks at the conference realignment breakdown including the MAC. IMHO, Army would be a good fit for the MAC. Like the Super Bowl, the College FBS National Championship game could be a bid on venue. Rivals.com reports UMass has offered to William Fuller, a 6-1 160 pd WR from Roman Catholic HS in Philadelphia, PA. He broke a Philadelphia single-game receiving record in September. Another article on Fuller's 10-276 2 TD game. 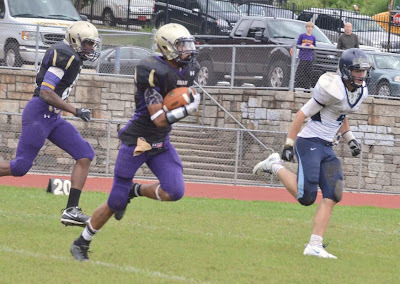 Fuller has offers from BC, Bowling Green, Rutgers, Temple, Toledo and Virginia in FBS. Delaware, Old Dominion, Towson and Villanova have offered from FCS. #21 was Kirk Nelms' number last year. Want to try on a Giants Super Bowl ring just like the one Victor Cruz is going to wear? There's an app for that. Cruz' mom will get custody of the ring most of the time. A Bleacher Report doesn't think Julian Talley will make the Giants roster. Another Bleacher Report writer picks UMass #123 in the universe of college football teams. 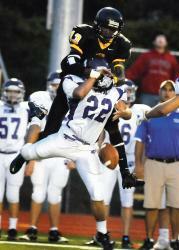 Reports say that UMass has recently offered to Ishmael Hyman, a 6-0 169 pd WR from St. John Vianney HS in NJ. His NCSA sports profile here. Hyman has offers from Syracuse, Rutgers, Boston College and Bowling Green in FBS. FCS schools JMU, Old Dominion and Villanova have also offered. The UMass football site has a sidebar video that is worth watching. It's about Coach Molnar's talk to the Boston alumni. The best quote is not by Coach Molnar, but by the facilities administrator who says :"Don't believe comments by a blog or something, we have the money (for the McGuirk upgrade) and it's progressing on time!" The new football offices/training facility will be a great boost to UMass recruiting and is absolutely necessary for the Minutemen to win in FBS football. Jeff Thomas has a story about UMass' OOC opponent Vanderbilt adding early commitments and Todd Stafford, the Minutemen's lone 2013 verbal so far. I blogged about Stafford back on March 17th. Blayne Taylor, the younger brother of Kerry Taylor, is headed to UMass to play Lax. I've had numerous mentions of Kerry Taylor in the blog. NBC Sports has an article on Liberty University's move to FBS and has several mentions of UMass. A preview of the Super Bowl ring Victor Cruz will be wearing. Jeff Thomas has piece saying UMass--BC--UConn rivalries make sense for all. UConn and Boston college are #63 and #64 respectively in average attendance per game in 2011 (.pdf download). The Huskies were #47 and the Eagles were #67 in percent capacity of stadium use (also a .pdf download). Games between the New England schools also make sense as reduced travel cost. In addition you would have to believe a number of each schools fans would make the drive. The business end of college football makes eminent sense for the three New England schools to play each other every year, but various egos will probably prevent it for some time. "Conference shifting likely isn't done. With the WAC crumbling and the BCS eliminating automatic bids, it looks less and less likely that Boise State and San Diego State will ever actually play football in the Big East, which means the Big East could be hunting for football programs again. " Jaskson Alexander asks "Who's UMass' starting QB?" The Cleveland Plain Dealer interviews Kent State President Lester Lefton on the state of MAC and Kent State athletics. He mentions UMass and states he does not think the Minutemen are happy about Temple leaving. The Plain Dealer also has a report from the MAC's conference meeting. The article mentions a possible increase in the MAC's TV financial package. Rivals.com says UMass has offered to Skai Moore, a 6-2 204 pd OLB from Ft. Lauderdale, FL. Moore holds double digit offers from Eastern and Southern schools. MassLive.com's Jackson Alexander looks at the state of the UMass receiving corps. Comcast Sports says Emil Igwenagu could bring versatility to the Eagles. The Eagles has Igwenagu's bio up on their roster. Victor Cruz was thinking of his mom this weekend. Could FCS Liberty be headed to the MAC? A National Football-Post writer wonders how Temple will fare in the Big East. MassLive's Jackson Alexander continues his series on the Minutemen; this time on the UMass running backs. He mentions SO Jordan Broadnax and RS SR Alan Williams. He does not mention roster running backs Jamar Smith and Jamal Wilson. In addition, several sources have said RB Michael Cox has transfered from Michigan. Mke Cardillo of the CTPost.com says UConn fans should relish a chance at a UMass rivalry. Sports Illustrated.com says Julian Talley showed the most speed of the Giants free agent WR's (at end of article). NJ.com has a story with some quotes from Talley about the Giants. Football Scoop has some comment and a video by Indiana HC Kevin Wilson. The Hoosiers coach mentions their trip to UMass (about the six minute mark) and urges Indiana fans to make the trip. The Bay State is, of course, busily solving all the really pressing educational problems. This years OOC opponent Vanderbilt also has a pretty inspirational video. The Commodores are actually making some progress in the SEC. 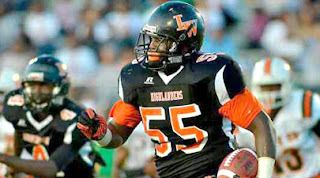 Polk Preps.com reports UMass has offered to Bobby Leath, a 6-3 290 pd DT from Lake Wales HS in FL. PolkPreps articles here and here. Leath holds offers from USF, Tennesse, Missouri, FIU, University of Miami, Marshall, UCF and Virginia. MassLive's Jackson Alexander looks at changes in the UMass coaching styles this year. Jeff Thomas has some comments about Coach Kelly's visit to Massachusetts and quotes from Kelly about Coach Molnar . NBC Sports reports that the NY Giants have signed all their draft picks and eight UDFA including Julian Talley. Tally has a roster bio up on the Giants site. Let's hope that mostly blank slate looks like Victor Cruz's soon. An ESPN blogger attended the Giants camp and had some good things to say about Tally's play. Note that Talley is wearing #3, which was the number Victor Cruz wore his first year with the Giants. Cruz's #3 jerseys, when they come up on E-Bay are usually high priced "collectibles". E-Bay currently has a Victor Cruz signed "UMass" jersey for $299.00. Note that it does not have the UMass logo on it. The Giants Blog "Big Blue" has bios of all the Giants undrafted free agents including Talley. Tampa Bay Times reports a UMass recruiter visited Nature Coast HS in the Bay area Thursday. 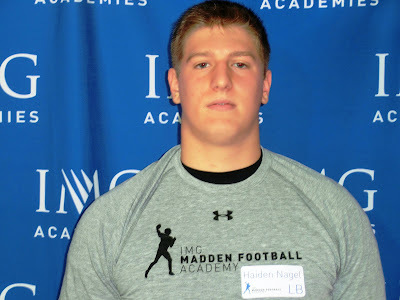 The Boston Herald reports UMass has offered to Jon Baker, a 6-4 305 pd OL/DL from Mills/Hopedale, MA. Baker quickly picked up offers from UConn and Boston College after UMass offered. Croart Sports has a capsule on Baker (scroll down). MassLive's Jackson Alexander asks if the Minutemen's run defense can improve in 2012? The Boston Herald reports on Notre Dame's Brian Kelley's visit to Massachusetts. Kelley comments on the state of Massachusetts HS football and the prospects of Coach Molnar at UMass. The ESPN Boston Blog has pretty much the same quotes. The Governor of Connecticut wants Boston College and UConn to kiss and make up. Sporting News ranks the 124 FBS college football coaches-----and picks UMass' Coach Molnar last. Rant Sports asks if Julian Talley can be the next Victor Cruz? Back in FCS, they're considering expanding the playoffs to 24 teams. Rivals.com reports UMass is interested in Cory Jasudowich, a 6-2 235 pd ILB from Cheshire CT.
Jasudowich has offers from Boston College and UConn. Other FBS teams interested are Georgia Tech, Iowa and Penn State. Jeff Thomas says MAC teams are eager to play first-year FBS team UMass for homecoming. The Boston Herald says Coach Molnar was a hit at the UMass Club last night. Note which Boston-area newspaper sent a reporter to cover the event. The Herald also has a story about the upgrade plans for McGuirk. Why "big" games for UMass football will stay in Gillette. A Bleacher report writer says UMass is "by far" the easiest game on the Wolverine's schedule. The Michigan Blog "Maize & Brew" interviews an Indiana blogger who says a loss to UMass is "non-negotiable" . ESPN's "Big Ten" blog looks at Michigan and Indiana, two teams we play OOC in 2012. Former UMass star Drew Comeau has started a group called UMass Football Alumni and Friends against ALS that will raise funds that will go towards purchasing season club seats for ALS patients that would like to get away for a day and go to Gillette and see some UMass football. A direct link to their donation page is here. The group is also on Facebook. The group is affiliated with the Blazeman Foundation for ALS. Comeau was a four year letterman for UMass from 1986-1989. He's been active in supporting UMass football since he graduated. ALS is a terrible disease (two of my HS graduating class died from it). If you could help his group, it would be a good thing. MassLive's Jackson Alexander looks at the UMass secondary and sees a team strength. Mentioned are safeties Darren Thellen and Christian Birt as well as Antoine Tharpe , Randall Jette and Ryan Carter. I missed this post on the UMass website about Coach Molnar visiting the UMass Club in Boston today between 5:30 and 7:30 PM. Boston area alums will have a chance to hear him speak about UMass football. There is also a video sidebar at the above site about the 2012 graduating UMass seniors. Fox Sports Midwest has a post about the 23 undrafted free agents of the Rams including Travis Tripucka. ESPN Boston has a long post about Massachusetts high school football and mentions UMass' move to FBS and stated intention to recruit Bay State kids. Centre Daily mentions UMass in Penn State's coming OOC schedule. Bleacher Report has a story about the "25 wackiest stadium names" and Gillette is one of them. This is a stretch for material even for Bleacher Report. The Post-Chronicle has an article on the Giants Kevin Gilbride and his offensive system that helped the Giants and Giants players like Victor Cruz succeed. Rant Sports ranks the Big Ten's OOC schedule. Since the Minutemen play two Big Ten teams this year, we get a couple of mentions. The Boston Globe says a split between the Big East and the Catholic basketball schools appears more likely than ever. The MAC Blog "Hustle Belt" looks at the MAC's football free agent signings (does not include UMass). I was looking at potential reinforcements for this coming season. The UMass Spring roster has eleven redshirt freshmen. The list is offense-heavy. With Rob Blanchflower, who went 18-206 1 TD in 2011 this group is TE heavy. Dan Foesel was the only three star recruit in last year's class. It will be interesting to see how Coach Molnar incorporates tight ends into the spread offense. ESPN Boston has an aticle from Mass High School Football Coaches Annual Combine. The story has information about a number of recruits UMass has either offered or is interested in. OT, but Coach Cal has his own website (natch! ), and he has an article where he talks about his "any team, any time" approach when he was at UMass. We had a comment with information about the players UMass has offered to at the Hun School, but Blogger has apparently vaporized it. If whoever wrote it will try again, I will try a second time to post the comment. MassLive's Jason Alexander has a story about who will replace Jesse Julmiste in kick returns. Mentioned are Brian Dowling, Marken Michel, Christian Birt and Iric Harris. The same group plus Antoine Tharpe are in the mix for punt returner. Alexander also says Perry McIntyre is looking for a breakout year. Alexander looks at the Minutemen's switch to a 4-3 defense. Delaware Online looks at the Hens situation in the CAA. A possible move to a FBS conference, including the MAC, is discussed. If you are having trouble remembering all the conference realignments, Phil Steele has an updated conference affiliation chart. The New-Sentinel wonders if Notre Dame's football season is already doomed. OT, but UMass basketball added to what was a good recruiting week for Minutemen by signing basketball guard Derrek Gordon. College basketball is a guard-oriented game. An All-Conference guard gives you the most impact for your bucks. If Coach Kelloge can string together some good years in a row, it would make UMass sports a more attractive package in future conference realignments. 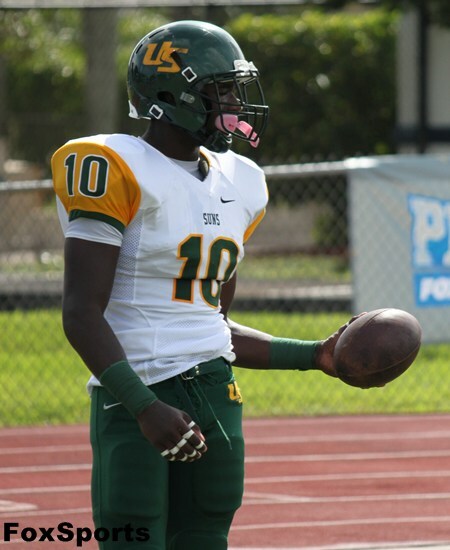 The Tampa Bay Times reports that UMass has offered to Zack Benjamin, a 6-5 182 pd WR from Tampa Catholic, FL. Tampa Bay Times article here (at the end of the story). Another article on his offers from UMass and Toledo. Big Country Preps has a story on Benjamin here. Caught 13 passes for 260 yards (20 yards/catch) and five TD's last season. ESPN Boston has a nice story about current UMass pitcher Joe Popielarczyk. It mentions former UMass WR Doug Clark. I've blogged about Clark before. My previous post about Clark has a scan from the UMass football press guide. Clark's wikipedia bio. 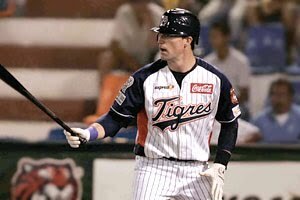 Clark's Tigres de Quintana Roo bio. A sports writer says UMass would be a good fit for the Big East in basketball if Notre Dame leaves. The Minutemen will be a good fit for both hoops an football. Temple OG Derek Dennis seems to be Josh Samuda's competition in the Dolphins free agent pool. Victor Cruz's book will be out July 17th. UMass has added Ian Maltz, a 5-11 175 pd K/P from the Hun School in NJ to its 2012 recruiting list. This article states that Maltz was the top dual kicker/punter in the nation. 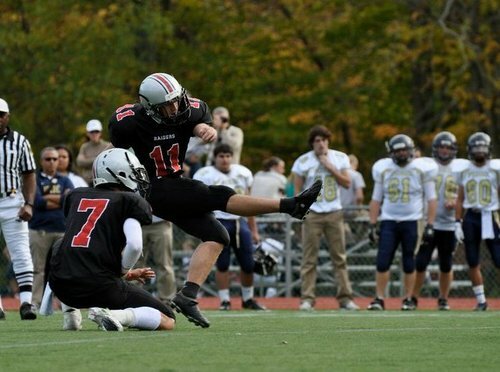 New Jersey first team All State, All Prep and All Conference Kicker in 2011 & 2012. NCSA has his commitment to UMass. Committed to UMass over offers from schools such as Texas Tech, Houston, Kentucky, Missouri, Ohio State, Florida,Rutgers, Bowling Green,Army,Navy and Elon. Recruited by Coaches Molnar, Sollazzo and Plummer. In a story that UMass fans could have predicted, the Boston Globe sees mostly difficulties in the Minutemen's move to FBS. The Maize and Brew Blog previews the Michigan-UMass game. Carolina Live looks at East Coast FCS football and the changes that are happening. Tom Dienhart looks at Indiana's 2012 schedule and says the Hoosiers need to be ready to play when they visit UMass on September 8th. This article on Butler has ten facts about the A10. UMass fans will notice the odd fit for the Minutemen. Ten of the fourteen schools are either private or Catholic. With Butler joining eight of the A10 schools will have less than 8,000 students. 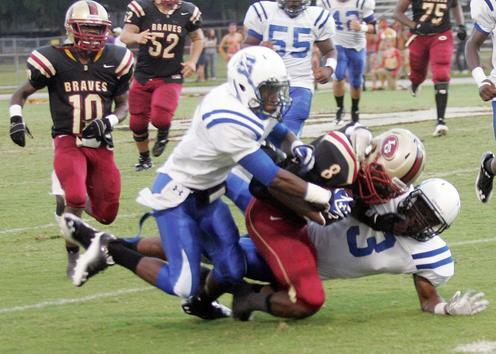 I've blogged about Justin Williams, a 6-1 185 pd DB from Treasure Coast, FL before. Since my previous post, I found a highlight video on Williams here. TC Palm reports that Williams has added offers this week from Purdue, Cincinnati and Middle Tennessee. This article about UConn NFL draftee Kendall Reyes mentions former UMass star Matt Jordan. Jordan was a four year letter winner for UMass in 1995 to 1998. 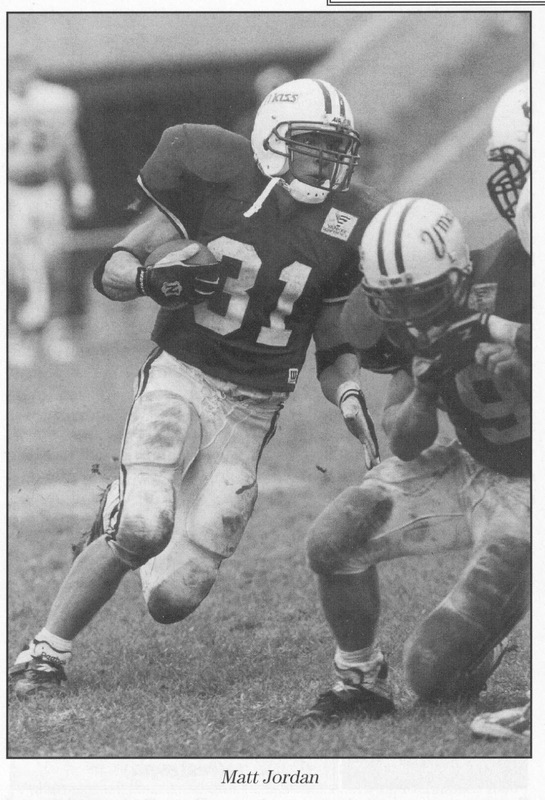 He was part of the 1998 trio of UMass running backs (Shipp, Quinlan and Jordan) that rang up 3,494 rushing yards in our National Championship year of 1998. Jordan was the 3rd leading receiver that year after Jimmy Moore and Kerry Taylor. He had 49-574 2 TD's receiving. The demise of the WAC may bring a significant increase in revenue to the MAC and other non-BCS leagues. UMass' old home, the CAA, may lose another member as Old Dominion reportedly has an invite to the CUSA. A Fargo newspaper has more on the changes coming to FCS. With Charlette and Temple leaving the A10 and Butler joining, the Minutemen's schedule in basketball will receive a big shakeup. With all due respects to Butler, Temple was a big loss to the A10. You remember that the University of Montana's President and the Head Coach of the football team had been dismissed because of problems with Montana football. Now the Feds are getting involved. I've put together twenty-nine images from the 2012 Spring Game. The Picasa Web Album is here. Matty V. has a short article on James Ihedigbo's "Hope Africa" charity. "Lost Letterman" college football site has a review of the 2012 Minutemen. Yahoo Sports looks at the five new FBS programs in 2012 including UMass. A CBS Sport columnist cites Emil Igwenagu as one of his 20 favorite undrafted free agents. Bleacher Report has an article on the Giants are hoping lighting strikes twice with undrafted UMass WR Julian Talley. Speaking of the Giants, the G-Men's general manager Jerry Reese says Victor Cruz did the right thing by turning down "Dancing with the Stars" (at end of article). Our former CAA Conference-mate Maine had one player in the NFL draft and three others sign free agent contracts. Boston College has dismissed Montel Harris, their all-time leading rusher, from the team. Departing UMass Chancellor Robert Holub looks at UMass' accomplishments including the move to FBS.